If you are looking for something to do this weekend, you should go to see Pirates of the Caribbean: On Stranger Tides! 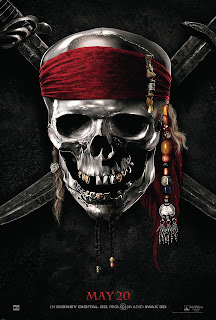 This is the fourth movie in the Pirates of the Caribbean series, but it definitely does not feel like it. Johnny Depp returns as the devious troublemaker Captain Jack Sparrow with his trusted comrade Gibbs. Captain Barbossa also makes a reappearance. The rest of the cast is completely new and includes Penélope Cruz. Along with the new crew comes a new story and a new adventure. I was actually really happy that this Pirates of the Caribbean did not have Elizabeth Swan or Will Turner (despite the fact that I love Orlando Bloom) because their characters had played out their parts and even overstayed their welcome a little with the last film. Personally, I think Captain Jack Sparrow makes the Pirates of the Caribbean franchise and did not miss Mrs. Swan or Mr. Turner at all. Penélope Cruz also surprised me by making a great Pirate with wit that is almost a match to Jack Sparrow's. I don't want to spoil any parts of the movie, so I am going to avoid details, but On Stranger Tides involves evil mermaids, an evil pirate (of course! ), lots of action and sword fights, booze (did you have to ask? ), zombies, cool special effects, amazing stunts, lies and deception, flirting, grand escapes and a perilous journey to one of the most sought after locations in history. The entire time there is a lot of fun and laughs. Johnny Depp is hilarious in just his demeanor as Jack Sparrow. Not to mention the quirky things that he says and does. He is definitely one of my all time favorite characters. The story line is also completely fresh and does not have that "been there, done that" feeling that sequels often had. Actually, On Stranger Tides is my favorite Pirates of the Caribbean thus far. You can also follow Pirates of the Caribbean on Facebook (they have a lot more photos including the amazing California Disneyland premiere) and twitter for updates and news. Let me know what you think of the movie! Disclaimer: I receive a free pair of critic passes to the pre-screening courtesy of Disney in exchange for this review. I was not compensated in any other way. All thoughts are 100% my own opinion and were not influenced by the free tickets in any way.